Edzell, What is peculiarly Canadian is the ease with which foreign interests can manipulate some Canadians opinions. Ironically, you prove my point. Ironically or otherwise, I think you just proved your own point. Further: If Sanders' aim is to gain support for the COAT - Coalition to Oppose Arms Trade - this item is maybe not helpful. No doubt many who cherish some of the myths he details, would nevertheless oppose arms trading. I wouldn't lose any sleep over that, Edzell. Anyhow, the shell of an organization that is COAT today is actually more of an academic vanity publisher run by and for Mr Sanders. And it has largely moved on from its historic focus on campaigning against the arms trade to one promoting Mr Sanders thesis about the myth of Canada as the "Peaceable Kingdom." "________s are a people deeply mired in their own rhetoric." I've certainly heard of COAT, but thought it had just petered out or been incorporated into some other movement or NGO, as happens all the time. I know at least one organisation (not this one; I know nothing of its current status) that is basically a "one-person-organisation"; that is, a person writing letters, sending out press releases and giving interviews as the representative of X organisation, of which person is the founder and only current member. As for the self-image thing, the positive, peaceful self-image is a big part of the ideology in the Netherlands as well (though they were rather beastly in the "Dutch East Indies", one of many cases where the colony is much larger than the coloniser). And having lived in Italy, I know that there are several things they simply have never addressed in terms of Fascism... "Italia brava gente" - sure, it was "less bad" to be occupied by the Italian fascists than by the Nazis, but still, they started the whole operation and have never owned up to it completely. I agree with Richard Sanders about ideology, but it is pretty much universal, not specifically "Canadian". ... a "one-person-organisation"...... of which person is the founder and only current member. (sorry, drifting briefly off-topic) I thought of doing that once. I'd have called myself the Fred Bloggs Institute and my avatar would be some earthy cloth-cap pub patron like Andy Capp. Could have been fun especially if inhabiting a second, more elitist identity to argue with him. Who'd have been his posher foil? I think you need someone with a cravat and a monocle. "Cravat Luxe"? ... plenty of Americans understand their country is an Empire ... and they don't care, or even approve. Canadians are in mass denial about similar phenomenon here in Canada. Yeah, clumsy on my part. I mean Canada as an imperialist country in its own right, playing a supporting role in the predatory actions of the Empire. And having some of its own economic interests, mining and other, in promoting, or its "brand" of policing, eg, Haiti, Honduras, mining in Latin America, intelligence for the US in Cuba, etc., etc. Wonderful! George Cubis vs Andy Capp, but please, don't forget Flo! Hmmm - oddly there's George's photo on Google but I can't find any online reference that would tie the photo to a real, recorded George Cubis. Fred Bloggs or Andy Capp? Not sure. I visualise my Fred as a rougher, less refined(!) character than Andy. More of a country bumpkin, not street-wise at all. But I (we) digress. Maybe I'll think about it and start something in anothere thread. If I do Fred would you like to be George? We could be suitably scornful of each other though I think George would be patient, if patronising. Thanks for the clarification. I almost missed it entirely. Is there a way on this forum, to be alerted to posts on "watched" threads? Click on "Active Topics" (upper part of page) and you will see a column listing the number of "new" posts on the right (in red). These are posts that are new since the last time you looked. Edzell wrote: Hmmm - oddly there's George's photo on Google but I can't find any online reference that would tie the photo to a real, recorded George Cubis. but now as we approach economic meltdown, and as so few are benefitting...working long hours multiple jobs barely to pay their shelter costs? I suggest there are appearances that the youth are waking up to reality, as confused as the political and social, cultural arena may seem...above all amongst the Indigenous Nations who´s integrity is being torn apart but the latest of mega project imperialism....It´s coming! a sea change! What is coming? A sea change of attitude? The biggest problem young people face today is that having a 'job' requires that they put the phone down and the little snowflakes simply can't imagine such sacrifice. Mega project imperialism huh? How, precisely, are Canadians expected to pay for their existence when every avenue that is traditionally open to them is opposed by the neo-modern Luddites and the new world order is an over-the-horizon concept? It may not be well understood by Luddites but their rosy delusions of high tech wizardry lifting the Canadian economy are not shared by the technical wizards who much prefer proximity to the beach than ten months of winter and two months of poor skating. Ah, if I may, I'll answer my own question: tax the rich. Politically imposed transfer of wealth from the 'elites' to the 'oppressed'. Since you have a substantial store of knowledge in that area, how has that worked out in the past? Reading of Dobbin's removal from the farm when I was young has had a tremendous effect on my capacity for cynicism. "Little snowflake" is an offensive rightwing term, usually used as an ageist insult against supposedly entitled young people, or against anyone who challenges the alt-right narrative. It is utterly inappropriate on a progressive board such as rabble/babble. A lot of crap like that littering the threads lately. i thought the whole post was offensive with the use of "luddite" and "little snowflake". i had to internet search to see what he was meaning with luddite. i still don't get it..
That's because it doesn't actually make sense. The original Luddites were workers who didn't want to see their jobs replaced by machines. It is also used as an insult against people who don't want to use modern technology. E P Thompson has written about the "enormous condescention of history" enough that we should all understand that resistance is never a waste of time, that Luddite is a compliment, especially if we re-appropriate the meaning as queers have done with "gay", and that we ought to honour those magnificent losers, those Don Quixotes, who came before us. The use the term 'luddite' I suppose could be better defined as 'neo-luddite' to identify those who oppose the use of modern technology that furthers the ability of the global population to support themselves but allegedly contributes to global warming. The original Luddites were weavers who resented machines improving on their production and taking their jobs. Why is it an insult? Utilising emerging technology to propel the world into a new era that minimises harm to the planet while providing for the needs of its population is a good thing, is it not? I did not know that. I thought it was an urban dictionary type term for youngsters who couldn't put the phone down long enough to get a job. "Luddite" is a bit different because it is also a term that many people have appropriated to describe themselves. For example, I'm a Luddiet because I don't have a smartphone - oh, I'd get one if I needed it, but I mostly work at home so have little use for it, except for certain apps and sources that can only be accessed that way. Martin, I didn't think you were using special snowflake on purpose - it is on the Oxford site but marked as "humorous". https://en.oxforddictionaries.com/definition/special_snowflake If you go to the discussions following rabble blogs, you'll encounter the types of trolls most likely to use the term - often they are climate change denialists. I've lived in other countries. I don't think that Canadians or Québécois are any more brainwashed on average than other inhabitants of industrialised capitalist nations. And there are many other forms of brainwashing (such as religion) that have a strong hold on people. In the first place, you refered to people as luddites who have delusions. You don't think that is an insult? In the second place, the current pipeline projects have nothing to do with providing for the needs of the population. They don't even provide lasting jobs. They are a firesale of our resources to provide profit. And it is hardly "emerging" technology. Remember the Berger Inquiry? Yes, if Martin is in fact referring to pipelines carrying petroleum there is nothing "modern" about that; it is so last century. And so very lethal. The use the term 'luddite' I suppose could be better defined as 'neo-luddite' to identify those who oppose the use of modern technology that furthers the ability of the global population to support themselves but allegedly contributes to global warming. One could equally use a different term to refer to those who deny the existence of global warming but support the use of modern technology that allegedly furthers the ability of the global population to support themselves. In my own view the use of terms such as these is counter-productive in trying to define and tackle specific problems that humanity may be facing. Such verbal shortcuts substituted for actual discussion of real problems may seem attractive but in fact they deflect attention from problem-solving towards personal animosity. Calling people names, then having to argue over what they mean, is unhelpful. sherpa -finn: thanks for the info & link. How fleeting is fame!! 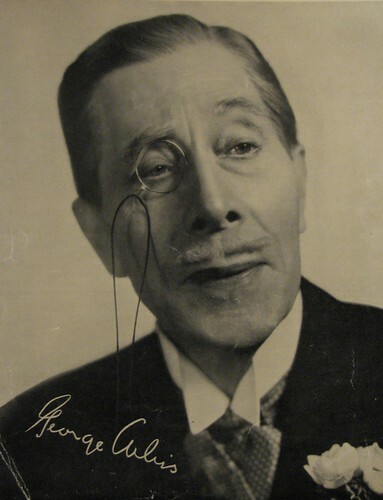 FWIW, the photo is actually of George Arliss, an old British actor. With bad handwriting. Apparently he was the first British actor to win an Oscar. Live and learn on a snowy Saturday afternoon. A mother, watching a parade claims: "oh look, everyone is out of step except my Johnny". Haha, could have been Galileo's Mum. I did not know that. I thought it was an urban dictionary type term for youngsters who couldn't put the phone down long enough to get a job. What is the "alt-right"? Our young people have the worst possible job market Canada has seen since the end of the Second World War and you blame them. That type of attitude is what leads some people to conclude Canadians can be easily manipulated into ignoring the real problems in our society including youth underemployment and poverty. WhIle I do sometimes enjoy savouring a seeming logical paradox, claiming that something is proved by my disbelief is just plain illogical, - not the same thing at all. Thanks, ikosmos. Some forums have the ability to alert one, via email or otherwise, to new posts in threads where one has already posted or which one is "watching." I guess that's not the case here? Apologies that I'm obviously still exploring how things work; old newbie, slow learner . I do sometimes enjoy a seeming logical paradox. But claiming that any "point" is "proved" by my disbelief in its basic assumption is just a non sequitur. Nothing there to ponder. I'm surprised no one has used the word 'cuck' here yet. I know it's coming. Let's hope not. It's not a particularly progressive term. And there surely must be better ways to suggest that a government or an electorate is incompetent than to suggest that their masculinity is in question. Could you link me to this pls? I looked around for this and found lots of articles talking about how well Filipinos view the US but nothing comparing to their opinions about their own country. Thanks. Canada itself is a fiction! Thanks for the post Richard, I agree with most of it. I think a Canadian identity can be real even if Canada is itself a myth. Sure. Here`s one source. I will look for more. Filpino positive attitudes towards USA up to 92% in the latest survey, I think. I agree. Martin, please don't use that term again as it violates babble policy.